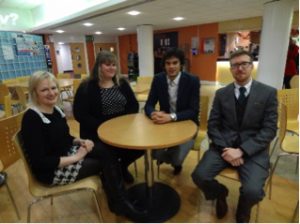 This year was the third year of the Gerard Maye Legal Client Interviewing Competition at the University of Brighton. Prior to the competition, students took part in a series of client interviewing workshops. The workshops, led by Law Lecturer Jeanette Ashton, covered communication styles, active and passive listening, question techniques, advising the client on the relevant area of law, and exploring both legal and non-legal options. Alongside having the chance to practise these vital skills, students had the opportunity to quiz guest Alexandra Stott (Personal Injury solicitor at LA Law, Brighton) on her interviewing experiences. Jason Pinkerton, University of Sussex graduate who went on to compete in the international final in Puerto Rico last year having won the Law Society national competition, even sent a video link from Canada with his top ten tips for interviewing success! The theme of this year’s competition as set by the Law Society, who sponsor the national event, was Small Businesses, a theme chosen to highlight how important commercial awareness is for our future lawyers. 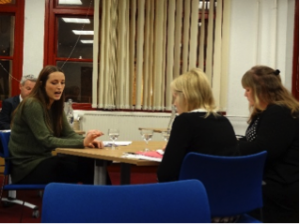 Two pairs of ‘solicitors’ Nathalie Landels and Carole Jowett and Patrick Kershaw and Leo Thivent, all CPE students, advised ‘client’ Becky Railton on a very tricky situation. 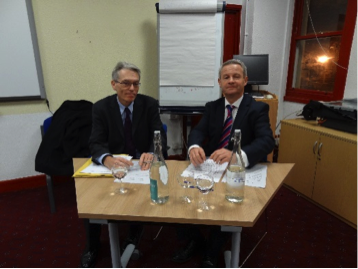 Gerard Maye (Criminal Defence solicitor) and John Searby (Civil Litigation solicitor), both from Gerard Maye Legal, judged the competition, with John commenting that he was glad he hadn’t had a client coming in to see him with this problem! The winning pair were Patrick and Leo who as well as receiving book tokens, now have the opportunity to spend a week working with Gerard Maye Legal which they are very much looking forward to. Last year’s winners Emily Titman and Rachel Braithwaite, who graduated from the LLB Law with Business degree in June 2014, attended this year’s final, with Rachel saying of her work experience “it was fantastic…literally the best work placement I’ve ever done”. 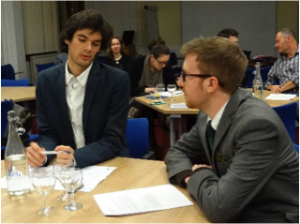 Patrick and Leo will now go on to represent the University of Brighton in the Law Society national heats in London in February.